Three “tardies” will count as one absence. Three absences will lower the student’s earned grade by one full letter. A student’s enrollment in the Music Department is for the duration of the entire school day, which ends at 5PM every day that ChiArts is in session. In order to provide a consistent education and to insure fairness to all ensemble members, it is the school’s policy that students must attend the entire school day. Early dismissal for any outside additional class or extracurricular activity is not permitted. A student’s enrollment in a designated department is for the duration of four years. The scope and sequence of the Music Department follows a highly rigorous sequential curriculum that begins with laying a solid technical foundation in the student’s instrument and mastering important standard repertoire. By the junior and senior years, the music curriculum progresses to encompass greater challenge and advanced instruction that will prepare students for college auditions. Each student must follow this sequence and is not permitted to request changes in their class schedule. Some interdisciplinary electives are already incorporated into the music curriculum in order to allow an understanding of other arts forms and how they relate to music. There is room for a small number of electives in each music track, but otherwise the scope and sequence of the music curriculum requires that students maintain strong focus on their chosen major. No exceptions will be made. Due to the particular scope and sequence of the curriculum and anticipated performances outside the scope of classroom instruction, we ask that students consult with the Music Department Head before enrolling in any outside artistic endeavor (e.g. other arts programs, camps, competitions and performances). 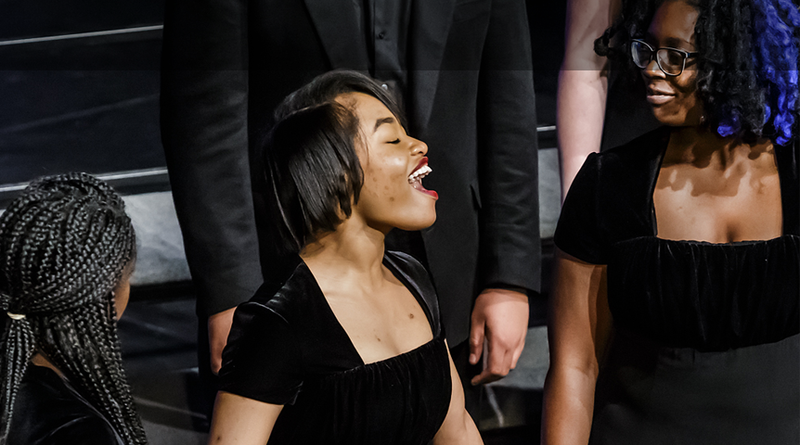 ChiArts requires its music students to be enrolled in weekly private lessons starting in the freshman year for both instrumentalists and vocalists. This individual attention is essential to address issues related to tone and technique and to master a body of solo repertoire suitable for college auditions. If a student enters ChiArts without already being enrolled in private lessons, the Music Department Head will assist him/her in finding a suitable instructor. ChiArts has a limited amount of financial aid available to defray the cost of private lessons for students demonstrating need. No tongue or lip piercings for vocal majors or wind players. For instrumentalists, nails must be no longer than fingertips. Students must wear solid black tops and bottoms for performances. Black athletic shoes and jeans are not acceptable concert attire. Ladies may wear either skirts or pants. Skirts should be at least knee length. If wearing skirts that are not floor length, please also wear black hose. Tops should be modest: either short or long-sleeves are acceptable, but not sleeveless. Please wear a top that is long enough so that no skin shows between the top and bottom garments. Gentlemen should wear a button down shirt. Students who wish to practice or rehearse in the Music Department classrooms outside of regularly scheduled instruction should make arrangements with the Music Department Head. Students may also petition to take certain ChiArts equipment or instruments out of the building for defined and limited periods of time. In these cases, parents must complete and sign the ChiArts Equipment/Instrument Check-Out form that confirms the financial responsibility of the parents in the event of damage to or loss of ChiArts property. Guests – No guests are permitted in class unless as part of a ChiArts designated day or activity. No food, candy or gum chewing is permitted in class. The only beverage that a student may bring to class is water in a bottle or container that can be sealed completely. Cell Phones must be turned off (not simply placed on silent) upon entering the classroom. Texting is not permitted. STUDENTS ARE ALLOWED AND ENCOURAGED TO BE CREATIVE, EXCITED, ENGAGED, HARD WORKING AND CONFIDENT! …NO EXCEPTIONS!